Today I have the chance to write about W a l t D i s n e y . . . I promise you it's really interesting, because I think we have all watched a film once a time. Something about Walter Elias "Walt" Disney . . . the reason and the inventor from Walt Disney films. He was born on the 5th December 1901 in Chicago. "Walter was an American film producer, director, screenwriter, voice actor, animator, entrepreneur, entertainer, international icon and philanthropist, well known for his influence in the field of entertainment during the 20th century. Along with his brother Roy O. Disney, he was co-founder of Walt Disney Productions, which later became one of the best-known motion picture producers in the world." He and his staff created some of the world's most well-known fictional characters including Mickey Mouse, for whom Disney himself provided the original voice. About his teenage years . . . In 1917 he went to the McKinley High School and took night courses at the Chicago Art Institute. He became the cartoonist for the school newspaper, drawing patriotic topics and focusing in the first world war. After the high school he wasn't allowed to go to the army because for being underage. After his rejection by the army, Walt and his friend decided to join the Red Cross. After this he went do France for one year, where he drove a ambulance. After this experience he moved back to Kansas City to begin his artistic career. He decided on a career as a newspaper artist, but nobody wanted him. His brother Roy helped him and got a temporary job at the Pesmen-Rubin Art Studio where he created advertisements for newspaper, magazines and movie theaters. At Pesmen-Rubin he met cartoonist Ubbe Iwerks and when their time at the studio expired, they decided to start their own commercial company together. 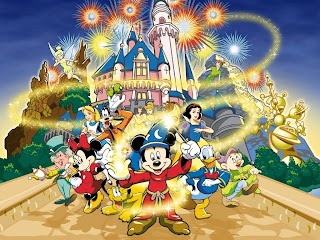 In January 1920, Disney and Iwerks formed a short-lived company called, "Iwerks-Disney Commercial Artists". However, following a rough start, Disney left temporarily to earn money at the Kansas City Film Ad Company, and was soon joined by Iwerks who was not able to run their business alone.While working for the Kansas City Film Ad Company, where he made commercials based on cutout animations, Disney became interested in animation, and decided to become an animator. Walt eventually decided to open his own animation business, and recruited a fellow co-worker at the Kansas City Film Ad Company. 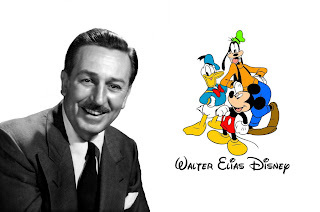 Disney became widely popular in the Kansas City area and through their success, he was able to acquire his own studio. Disney and his brother pooled their money and set up a cartoon studio in Hollywood. Disney sent an unfinished print to New York distributor Margaret Winkler, who promptly wrote back to him that she was keen on a distribution deal for more live-action/animated shorts based upon Alice's Wonderland. So that was the really begin of his career . . .
D I S N E Y L A N D ! ! ! Walt Disney was a chain smoker his entire adult life, although he made sure he was not seen smoking around children. On the 2nd November, doctors at Providence St, Joseph Medical Center, discovered a tumor in his left lung.Five days later a biopsy showed the tumor to be malignant and to have spread throughout the entire left lung. After removal of the lung on the 11st November, doctors informed Disney that his life expectancy was six months to two years. After several cobalt therapy sessions, Disney and his wife spent a short time in Palm Springs, California. On 30th November, Disney collapsed at his home. He was revived by fire department personnel and rushed to St. Joseph's where on 15th December, 1966, at 9:30 am, ten days after his 65th birthday, Disney died of acute circulatory collapse, caused by lung cancer.The last thing he reportedly wrote before his death was the name of actor Kurt Russell, the significance of which remains a mystery, even to Russell. Roy O. Disney continued with the Florida project, insisting that the name be changed to Walt Disney World in honor of his brother. "He was up in the third floor of the animation building after a run-through of The Happiest Millionaire. He usually held court in the hallway afterward for the people involved with the picture. And he started talking to them, telling them what he liked and what they should change, and then, when they were through, he turned to us and with a big smile, he said, 'Keep up the good work, boys.' And he walked to his office. It was the last we ever saw of him. " 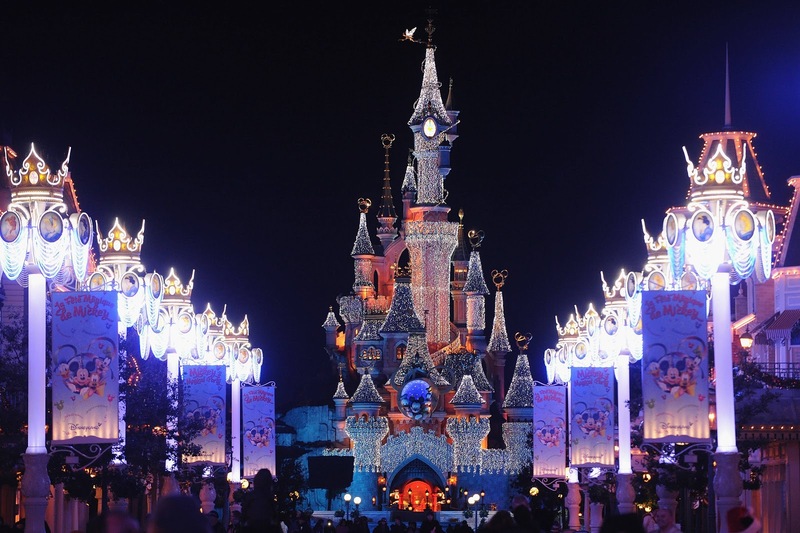 "In the 1990s, reflecting on her 41-year marriage to Walt Disney, she said, "We shared a wonderful, exciting life, and we loved every minute of it. He was a wonderful husband to me, and wonderful and joyful father and grandfather." it was the best thing he did. The Meaning Behind Nursery Rhymes.